Many times, when our beloved canine is young and left unattended, starts chewing wooden door trim. We, being homeowners sometimes do not understand why our pets do such acts and which pleasure they are having in biting furniture; but it is one of the major issues for all of us. The only prevention of this action is to stop them chewing the trim or the valuable furniture of your house, but that may take some time. For that, you have to train your dog at the early age. But what to do if he already chewed one of the wood trim in your home and it looks worse in front of guests? Don’t worry. Here in this article, you will find out some easy ‘Do It Yourself’ tricks for trim repair. Read on and know more about repairing door frame. There are many ways to fix the wooden furniture if the dog or other pets scratch, bite, or chew it. Here, I am going to show you the most straightforward way of trim repair. When there are some damages like cracks, or even a gouge on your door because of your dog’s superpowers of clawing and scratching, you have to fix it with wood filler. Let’s see how you can do it all by yourself. Use the pull scraper and remove all the wood splinters. Now send all the dust away using the sandpaper. It will smooth the wood. Don’t worry about the finishing, because you can do touch-ups later. Buy good wood filler from the market. Then, take a small piece of cardboard and put some of the putties on it. After that, have some hardener to put with it. One can tell by the colour if you are getting enough in there. Now mix it up and see what it looks like! When you put a lot of hardeners, it’s going to set up quickly, so just be aware of that. It’s important to mix it thoroughly. So, when the mixture is ready, go and apply the filler thoroughly and then scrape off the excess. Make sure that you have the hole filled though. It’s alright for it to be a little bit over full because we can send this down later. Let it sit for 20 to 30 minutes until it hardens up thoroughly and then sand it with some sandpaper. You can use different grit sandpapers until the part of the door feels nice and smooth. That is the excellent way to do it. Now it is ready to be primed and painted. Paint or polish with the door colour to give it the ‘as usual’ look like your doors. Try to do this fixing outdoors, because these fillers are quite toxic. Read all the warning labels of the can and follow the directions. If you are doing it inside the house, you should probably wear a dust mask. If the pet had hollowed the door from the middle, you could still make it up with the proper use of cardboard. How? Have a look! Make sure that the door is still sound. There should be enough room around the damage to keep the door strong. Measure the width of the door and the length of the area you want to cover. Deconstruct a cardboard box larger than the hole. Use scissors or knife and slit open the bottom. Work on a large flat surface. Slit the box along one edge so that you can lay it down flat. If you are using any second-hand cardboard, then use the inside of the box on the outside of the door, so you have no writing on it. It will look nicer. When you are ready with the boards, use the duct tape and tape the front in place. Make sure it is straight before taping it down on all the sides. You don’t need too much tape on the sides of the door or underneath because it may not close properly. Dogs may do such acts when they are bored, freaked out, angry, irritated, insecure, unattended, or anxious. Apart from that if we look at the simple term, they bite the door to come in and go out, they start eating a hollow core of the door or scratch the door jambs. For such issues, you can try some electronic dog doors, which is the easiest solution for all these problems! Try once and relax. So, these were some easy ways to fix your wooden valuables chewed by your furry friends. 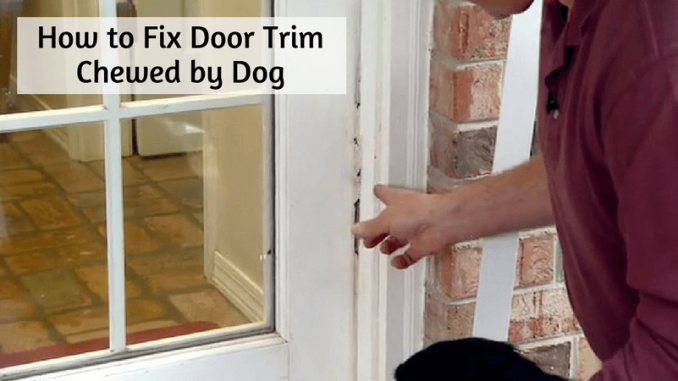 Don’t get upset with your dog because you can always find out the economic and DIY solutions of how to fix a door jamb here! How to Install a Doggie Door in a Wall – Know the Best Way?